Our Screen Printed Dog Dresses are perfect for casual wear or special occasions and are available in several fun designs! Affordable, high quality knit fabric with double seaming for added durability. Made of 50/50 Cotton/Poly blend for minimal shrinkage. Sleeveless. Sizes XS - 4XL (8" - 20" lengths). Fits Toy Breeds to Large Dogs! Turn inside out and Machine wash and tumble dry low to protect the rhinestones. MEASURING GUIDE: The SIZE CHART Is the ACTUAL dress measurement. 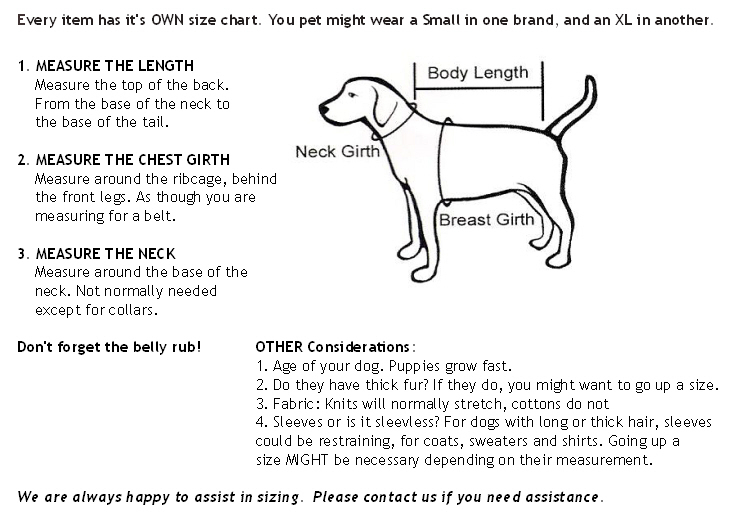 The first important measurement is the Chest girth, measure your pup around the chest directly behind the front legs. Then measure the length from the neck, where the collar lays to the rump where the tail begins. 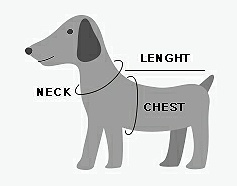 The neck measurement is normally not important unless you have a dog with an unusually large neck. EXAMPLE: If your dog is 19 - 20 inches long, order a size 3X (20), if he is 11 inches long, your choice is a Small or Medium. Use the Girth measurement to determine which size you want. If your pup is 11" long and has a 15" chest, order a size Medium, but if he is 11 inches long and his chest is 11 - 13 order a size Small. The dress is sleeveless so there is still a little stretch and give. If your dog has a LOT of fur, you need to take that into consideration too. Feel free to contact us if you need assistance; provide the name of the item and your pups measurements. We cannot guess based on weight alone. Your Dog may usually wear a Medium, but every designer has their own size chart. He may wear a Small or Large in this. PLEASE take the time to measure, we want your order to fit when you receive it. If it is outside our normal hours, you can enter the chest and length measurement in comments at checkout, or email us.